Slow-roast the meat in the oven at 85°C for 12 hours (reduce cooking time to 8 hours if meat is fresh). Stir together the marinade ingredients and place in a plastic bag, along with the roasted meat. Leave to marinate for 4-5 hours. To make the sweet pickled chanterelles, put the first six ingredients into a pan and bring to the boil. Turn off the heat, add the chanterelles and leave to cool. Drain before serving. 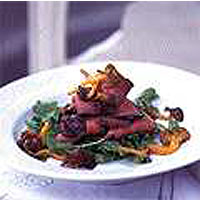 To serve, thinly slice the meat and serve with sweet pickled chanterelles on a rocket salad.